The rules used in Olympic equestrian competitions are the international rules established by the Fédération Equestre Internationale (FEI). They are the same rules used in international competition for all FEI-sanctioned events, such as the World Equestrian Games. There are three main Olympic equestrian events: show jumping (or stadium jumping), dressage, and eventing. While some portions of the competition, such as dressage, are based on subjective judging, others are based on timing and faults or penalties. Keep pen and paper handy and watch the time clock (accurate to hundredths of a second), and you should be able to track the riders' scores at home. In the event of a tie, a jump-off is held to determine the winner. The jumps themselves, while imposing-looking, are made to fall if the horse hits any portion of the structure. A ground jury consisting of various judges and officials (and qualified according to FEI standards) inspects the course and judges the competition. Horses must be at least nine years old for Olympic competition. A bell is used to communicate with the competitor to signal when they may enter the arena, alert them to halt or continue after an interruption, or to indicate that the rider is eliminated. Red or white flags are used to mark obstacles or mandatory turns. Jumps generally are categorized as spreads, verticals, or water jumps and may be set up in combinations. Four faults are given for each jump knocked down (a rail or one or more parts of the jump falls to the ground). Four faults are given if one or more hooves leave an impression on the lath surrounding a water jump. Four faults are given for the first disobedience (such as a run-out or refusal to jump). One penalty point is given for every four seconds or portion of a second exceeding the time allowed in the first and second rounds and jump-offs not against the clock. One penalty point is given for each second or portion of a second exceeding the time allowed in a jump-off against the clock. Dressage competition includes the dressage event and the dressage phase of the eventing competition. Judging for dressage is perhaps the most subjective of all the Olympic equestrian sports. 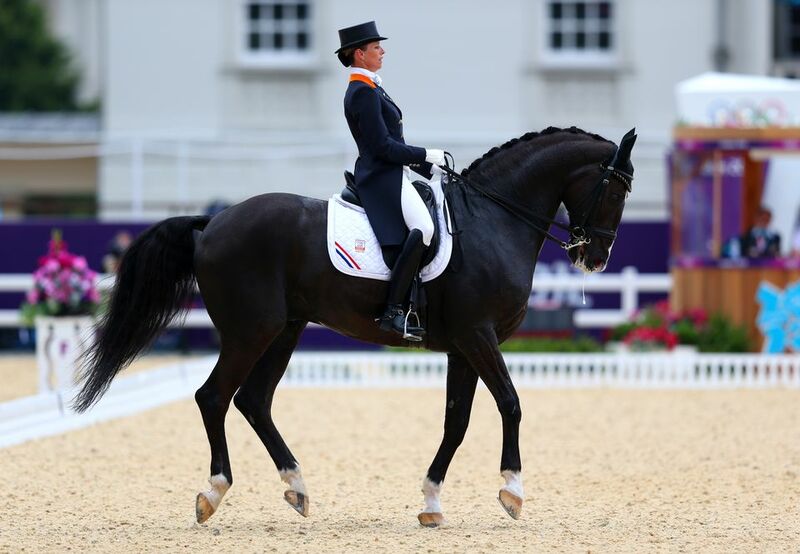 FEI rules outline the standards for each gait and element of the dressage test. Five judges, positioned around the outside of the 20-meter-by-60-meter (21.9-yard-by-65.6-yard) dressage ring, give each element a score, usually from 0 to 10 with some elements being given greater weight by multiplying the score or "coefficient." The ideal score is 100 percent. Rules regarding the type of tack and dress that may be used are very strict. Competitors are disqualified if all four hooves land outside of the dressage ring, the horse refuses to perform for over 20 seconds, or the horse or rider falls. Penalties are given to riders who go off track or do not salute properly and for other minor infractions. These are deducted from the overall score. At the Olympic level penalties of this type are rare. Eventing is a combined competition that includes phases of stadium jumping, dressing, and cross country jumping. Rules for the stadium jumping and dressage phases of eventing are similar to those used for the individual events. Cross country jumps are very imposing and not designed to fall or come apart when struck by a horse, although this is slowly changing because of the many deadly accidents that have involved both horses and riders. There may be verticals and spreads made of natural and manmade materials, and the course can include ditches, hills, streams, and banks. Judges sit at each obstacle and record any infractions. For the cross country phase, an "optimum time" is established. There is no benefit to finishing earlier than the optimum time, but penalties are given if the rider exceeds the optimum time. Riders may remount after a fall.